← Join us at SharePoint Conference 2019! 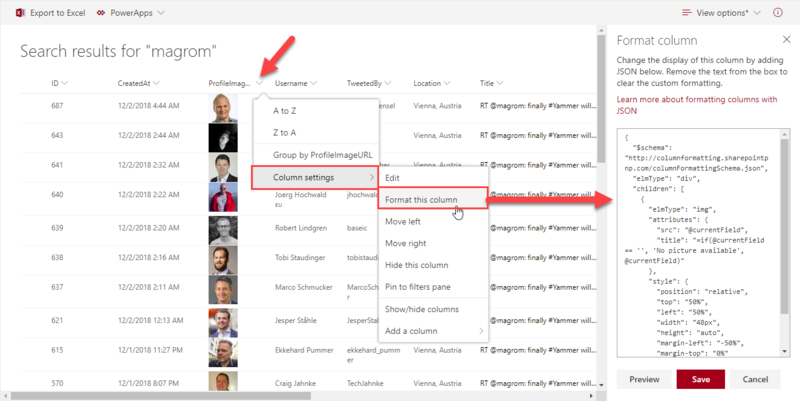 Today I want to share just a quick tip for custom formatting views in SharePoint lists. 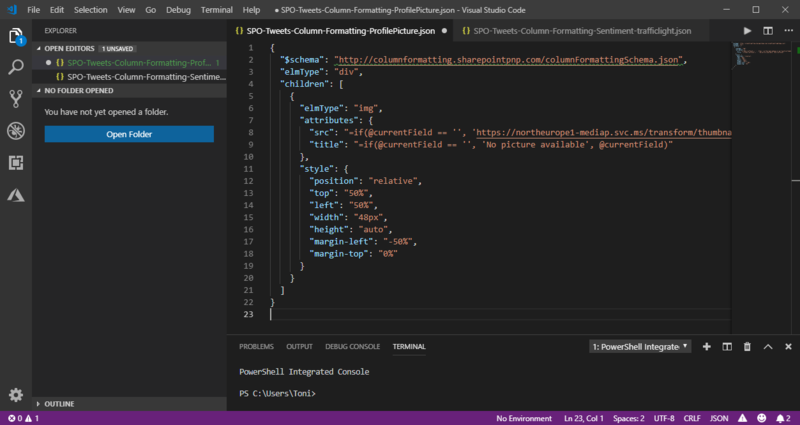 My goal was to show a picture of a text field that contains an URL and to use conditional formatting with a traffic light system to visualize the sentiment of tweets that are written to a SharePoint Online custom list from a Flow. See the formatting options here. Here, the PofileImage picture and the Sentiment columns are formatted individually. Actually, it's simple to use the JSON formatting as described. But, as we all know, the devil is in the detail. The JSON object follows a strict schema and it's case sensitive. Also, it's good to know, that it's possible to use CSS classes from Office UI Fabric to apply styles. What really helped me was the project SharePoint List Formatting Samples on GitHub to see more samples as the contact-card-format and to understand the possibilities. To apply a column formatting, click on the column header arrow down symbol, open "Column settings" and "Format this column". 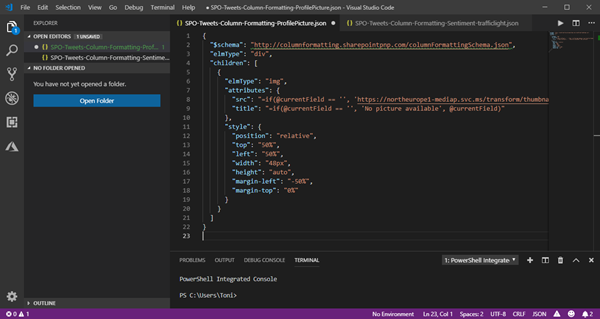 The "Format column" panel opens on the right side where you can paste your JSON object. Here, the "Preview" button helps to see the style applied. ... instead of text "https://pbs.twimg.com/profile_images/961530018164891648/aj4eQeS-_normal.jpg"
"title": "=if(@currentField == '', 'No picture available', @currentField)"
The element type is rewritten to "image" and the content @currentfield is filled into the attributes of that HTML tag with some object formatting followed in the "style" node, e.g. the picture is 48px wide, etc. As you can see, it's simple HTML and CSS (see below) in the DOM tree. That's the trick to have an image object rendered instead of a text output. It took a while for me to figure that out with the contact card sample... but that's it. The second formatting applies to column Sentiment. Depending on the value, the box shall be formatted with an icon and a background color and the text shall be enlarged. Here we group by value into green (>=0.75), yellow (0.5 to 0.74) and red (<0.5) elements as here. Well, this is also easy to accomplish with predefined classes and icons. see also Office UI Fabric, e.g. colors and icons. "class": "=if(@currentField >= 0.75, 'sp-field-severity--good', if(@currentField >= 0.5,'sp-field-severity--warning', 'sp-field-severity--blocked'))"
"iconName": "=if(@currentField >= 0.75, 'CheckMark', if(@currentField >= 0.5,'Forward', 'Warning'))"
The filed is using double font size and a predefined width to cut the value, just as an example for formatting with CSS. These formatting options are very powerful and can help to visualize a simple SharePoint custom list and give the data more weight. Of course, these JSON objects can become quite large and complex (as e.g. at mrik23 Gist samples). In most cases, these simple formats are helpful. We also used similar formats for SharePoint lists in our Office 365 Groups Governance Toolkit. So, bring more visibility in your custom lists life!